1 Find A Grave, (accessed 03/17/2013). 2 Beyer, Mary Queal, A Genealogical History of the French and Allied Families, Cedar Rapids, Iowa: The Torch Press (1912), 235, [Birth]. 3 Beyer, Mary Queal, A Genealogical History of the French and Allied Families, Cedar Rapids, Iowa: The Torch Press (1912), 238, [Death]. 4 Clarke, Mrs. Louise Brownell, The Greenes of Rhode Island, New York: The Knickerbocker Press (1903), 421, Internet Archive (Digital Library). 5 Encyclopedia Britannica Online, "James A. Garfield", (accessed 05/15/2010), [Birth]. 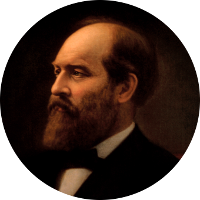 6 Encyclopedia Britannica Online, "James A. Garfield", (accessed 05/15/2010), [Death]. 7 Roberts, Gary Boyd, comp., Ancestors of American Presidents , Boston: New England Historic Genealogical Society (2009), 440, 442, 458-460, 481-482, 535, 614. 8 Rockwood, Vivian VaLera, Four Centuries of American Descendants of Richard Rockwood of Dorchester 1633, Braintree 1636, Massachusetts, Johnson City, Tennessee: Overmountain Press (2000), 1175-1176. 9 Wikipedia, "James A. Garfield", (accessed 03/07/2013).